It is difficult to make oral hygiene fun and exciting. A recent Kelton Global Survey of American moms found that 52% of moms dread getting their child to brush their teeth in the morning, while 92% of moms will go to extreme measures (bribing, punishing, giving ultimatums) to get their child to brush in the morning and at night. Sometimes a walk across the Goazon Badlands seems more pleasant. 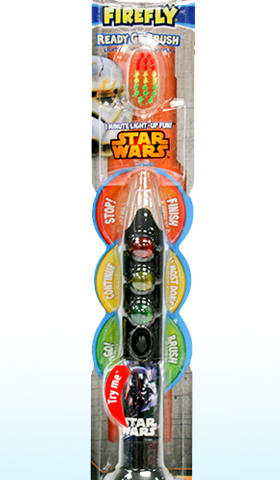 But Firefly has succeeded in making brushing fun with their new Star Wars 3D character toothbrushes, as well as their Ready Go toothbrushes that feature a light-up timer. In my thirteen years as a dentist I have seen a lot of toothbrushes, but the new Star Wars toothbrushes are some of the most impressive. The first Star Wars character in the new 3D tooth line is the original trilogy Stormtrooper, and the sculpt is amazing! If a Stormtrooper’s aim was as accurate as the sculpt of this toothbrush, Luke, Leia, and Han never would have made it out of the Death Star alive. The broad base also makes it easy to stand up the toothbrush in between brushes. The one drawback I found is that having the character on the handle makes it a bit uncomfortable to hold, but that is a small trade-off for the stunning appearance. Kylo Ren and other character toothbrushes are set to be released in 2016. Tooth decay is the most common disease in children, and, usually, even if a parent is able to get their child to brush their teeth, the child doesn’t brush long enough. The Firefly Ready Go toothbrush seems to be destined to remedy that problem. It features flashing lights set to a one minute timer to help kids know how long they need to brush. These are available in several Star Wars characters, including First Order Stormtrooper, Yoda, Obi-Wan Kenobi, Darth Vader, Kylo Ren, and BB-8. They also have a broad base to help reduce the clutter in your hidden base or space station. Since it is recommended that kids brush their teeth for 2-3 minutes 2-3 times a day, I wish the timer was longer than one minute, but that just means that they get to start the timer over a couple of times. Just like recharging the Death Star. Even my kids resist me when I ask them to brush their teeth. Since Force chokes are frowned upon, Firefly Star Wars toothbrushes seem to be the next best option. My kids were so excited to try out these toothbrushes that they fought over which one each of them would get to use, so we had to go through some negotiating. Sometimes aggressively. But it was refreshing to see my kids get excited about brushing their teeth, and now they want to get the rest of the Star Wars character toothbrushes. Now if there was just a way to make flossing more enjoyable. Firefly toothbrushes can be found at fireflytoothbrush.com, and also at Target, Walmart, Kroger, and Walgreens. I highly recommend these toothbrushes for a fun battle against tooth decay and to help promote excellent oral hygiene in children. Thanks so much for reading my review. If you have any questions or comments you can contact me on Twitter @ryderwaldrondds or email me at ryderw@coffeewithkenobi.com. Remember to brush 2-3 times a day, floss daily, visit your dentist regularly, and listen to Coffee With Kenobi. Next article Rebels Reactions: "The Honorable Ones"
Previous article The Force Awakens is a Winner at the MTV Movie Awards!